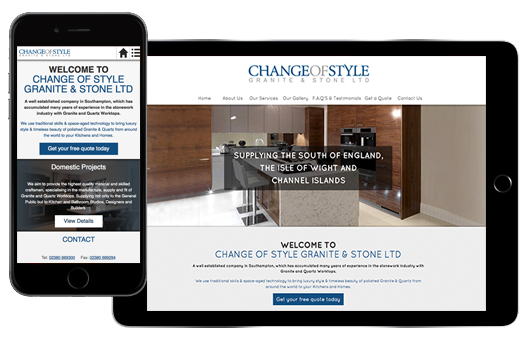 This week's website of the week goes to Change of Style Granite & Stone LTD, located closely to us in the City of Southampton. It was a pleasure working with this talented and very friendly company and the team really enjoyed putting together the new design for the website as well as an accompanying mobile website. Change of Style work on both Domestic and Commercial projects and have furnished everything from the homes of local clients to the grand ships of large ferry companies like P&O Cruises. Taking this into account, they needed a website design that was modern and simple yet attractive to an extremely wide and ever increasing clientèle. They also needed their website to be eye catching on mobile view for anyone searching for them using mobile devices, which is an ever growing preference for browsing the web. The Home page is clearly separated into different site-wide panels which guide the visitor to the Domestic and Commercial pages, each with their own attractive layouts to suit the existing content. The design was kept fairly simple overall so that the mobile website would be easily integrated as well as still recognisable from device to device. The panel layout is perfect for both PC and mobile screens as it separates text nicely and is easily custom-styled. Some changes have been made to make the website appear simpler on smaller screens as large images can be off-putting and make text hard to read, but overall the content is exactly the same as the PC version. If you're thinking about making your own website mobile friendly, just get in touch with our Support Team.